Terms and Conditions – ‘Strong Like Samson’ competition. This competition is organised by Skye Distribution (Pty) Ltd (‘Skye’). The competition starts on 10 November 2017 and ends at midnight on 31 December 2017. No late entries will be considered. The competition will run in selected retailers in South Africa. 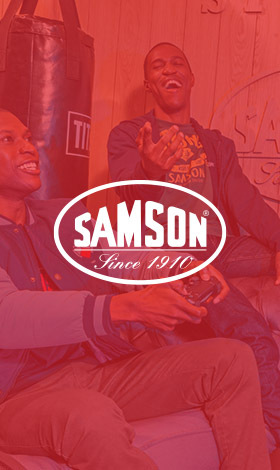 Details of participating retailers are available on www.samson-sa.co.za. By submitting an entry, you agree to these terms and conditions. Only residents from South Africa may enter the competition. The competition is not open to anyone associated with or affiliated to Skye or the sponsors or organisers or a supplier of goods or services to the competition. Tell us why you are #StrongLikeSamson and post, share and tag @SamsonAfrica on Facebook, Twitter or Instagram. During the competition period one winner each week with the best post will win a microwave to the value of R1 000.00. Winners will be announced each Tuesday. Winners during the period 16 December 2017 to 31 December 2017 will be notified during the period 15 January 2018 – 19 January 2018. SMS entries will be verified and monthly winners will be chosen from audited random draws at Skye on 1 December 2017 and 15 January 2018. Each month the first place winner will win a flat screen TV to the value of R7 000.00. The second place winner will win a fridge to the value of R5 000.00. The third place winner will win grocery vouchers to the value of R5 000.00. Winners will be announced during the first week of December 2017 and during the third week of January 2018 respectively, for the monthly draws. Winning a weekly prize does not disqualify you from the SMS competition. Winning a monthly prize does not disqualify you from the social media competition. You can only win one monthly prize. You may enter the social media competition and the SMS competition once only with each purchase and receipt. Keep your proof of purchase to authenticate your entry. Should you return the purchase, the receipt will be marked as ‘invalid’ and you will not qualify for the competition. Winners will be announced on the Skye and/or Samson websites and social media platform. Winners will be contacted within 7 days of the announcement. Winners will be offered a preloaded voucher specifying the prize to be collected at the nearest Makro retailer. Should a Makro not be close to the winner, Skye will arrange a preloaded voucher at a retailer close to the winner. The value of the preloaded voucher will remain the same irrespective of the retailer. Should the prize not be available at the alternative retailer at the preloaded value, the winner will be able to use the voucher to purchase an alternative prize. Skye is not liable for any delivery costs incurred in collecting or transporting prizes. Incomplete, incorrect, or illegible entries will be disqualified. No responsibility is accepted for entries that are late, delayed, misdirected or incomplete, or for failures due to malfunctions in communication services or for any other reason caused by events beyond the control of Skye, which may cause the competition or entries to be disrupted or corrupted. Proof of sending does not constitute proof of actual receipt by the organiser. Skye may, at its discretion, disqualify incomplete or fraudulent entries or entries that do not comply with these rules. Skye may also disqualify an entrant if Skye finds that the entrant has attempted to manipulate the outcome of the competition. Skye will attempt to contact a winner at least 3 times via telephone. If Skye is unable to contact the winner, or if the winner does not claim the prize within 7 days of the date of first notification, then the winner will, if determined by Skye, forfeit the prize and Skye reserves the right to award the prize to the next eligible winner. All prizes are non-transferable, and will only be awarded to the person whose name and receipt number matches the winning entry. Prizes cannot be deferred nor exchanged for cash or for any other prize, subject to clause 20 above. If the advertised prize is not available, you may be offered an alternative prize of similar value. No warranties or representations are given or made as to the state, condition or fitness of the prizes. All taxes (including income tax if applicable), insurances, licenses and other expenses resulting from the prize is the sole responsibility of the winner. In the event that a winner is a minor, the winner must be accompanied and assisted by their legal guardian. Winners may be invited to appear on and be identified in national or regional media, including radio and television at no fee, but winners may decline such invitation. Skye and/or Samson may use, broadcast or publish the names, photographs and details of a winner unless the winner objects. Personal information submitted as part of this competition will only be used to notify the potential winners, for purposes related to the competition, as well as for marketing with an opt out option. In the event of a dispute regarding any aspect of the competition and/or these terms and conditions, Skye’s decision will be binding and final and no correspondence will be entered into. The selection of the winners is final. No appeals or correspondences will be entered into. Only winning entries will be contacted by the organisers. Skye reserves the right to withdraw or suspend the competition or to amend these terms at any time if events or circumstances occur outside its control which makes this necessary. You will have no recourse whatsoever against Skye and its associated agencies and retailers in this event. Skye, its associated agencies, retailers and prize sponsors shall not be liable for and you hereby indemnify and hold Skye harmless against any claim, liability, damages (whether direct or indirect), cost, expense or penalty suffered or incurred by any person as a result of participating in the competition or the acceptance or use of a prize.